Bugeoguk is made with dried pollock strips and radish. 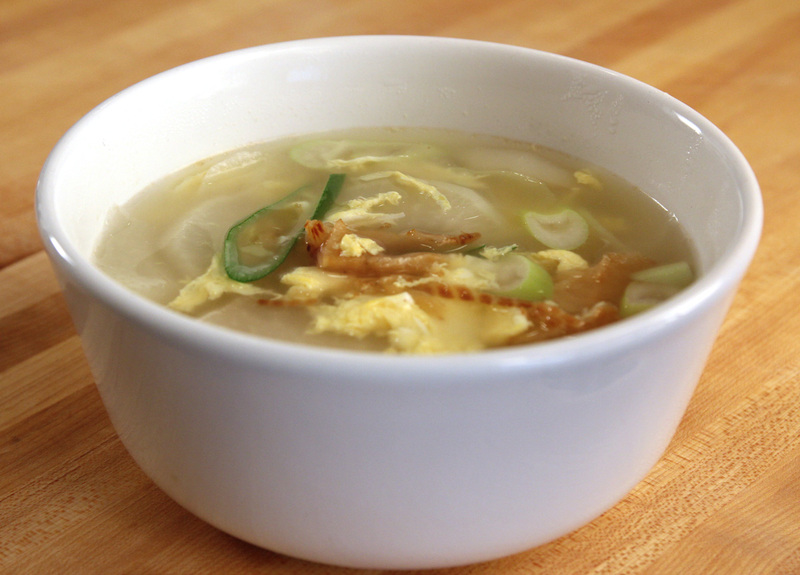 The soup is known as hangover cure soup among Koreans. You don’t need many ingredients to make this soup. Good quality dried pollock is made when it’s dried by the wind from the sea. When it’s totally dried, the fish turns very hard like a wooden stick. : ) When it’s cooked, the fish meat has a unique taste which is not only chewy, but also soft at the same time! Delicious flavor and taste from the dried pollack meets sweet radish! What will happen? Delicious! If you make this soup early in the morning for your husband or wife (^^) who are suffering from a severe hangover, you will get lots of credit from him or her. Some may ask: “Maangchi, I’m sober, can I still have this soup?” lol, of course! You don’t have to have a hangover to eat this soup. I’m sure I will get emails about this unless I make it clear right now. Another benefit of this soup is that you can fill your stomach with this and a little bit of rice and it will help you control your weight. Take 2 oz (60 grams) of dried and shredded pollock from a package and tear each strip into thin pieces by hand. They should be about 2½ inch long (6 cm). *tip: 1 package of dried shredded pollock that I use in the video weighs 150 grams (about 5 oz), so you could make 5-6 servings with 1 package. Peel a radish and slice it into small pieces (2 x 3 inch and 1/8 inch thick) to make 2 cups’ worth. Slice 2 stalks of green onions. Mince 4 cloves of garlic. Beat 1 egg in a small bowl with a fork. Set them all aside. Heat up a pot and add 1 tbs sesame oil. Add the dried pollock strips and the minced garlic to the pot and stir it for 30 seconds with a wooden spoon. Add 7 cups of water and the radish. Close the lid and boil for 20 minutes over high heat. 20 minutes later, open the lid and add 2 tbs fish sauce. Lower the heat to medium-low and simmer for 2-3 minutes. Open the lid and pour the beaten egg into the boiling soup. 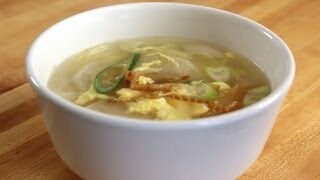 *tip: Don’t stir the soup until the beaten egg is cooked and floating. Turn the heat off and add the green onion. Stir it with a ladle so the green onion is cooked a little by the boiling soup. Serve with rice and side dishes including kimchi. Posted on Friday, June 4th, 2010 at 2:36 pm. Last updated on April 26, 2015. Posted September 14th, 2016 at 8:18 am | Log in to reply. Hi Maangchi! I tried making this recipe, but the soup was rather bland for me. Is there a spicy version of this soup? Posted September 20th, 2016 at 12:49 pm | Log in to reply. You can add hot pepper flakes right before serving if you want. This soup is usually eaten non-spicy version. If it’s too bland, add more dried pollock. Posted May 31st, 2015 at 4:24 pm | Log in to reply. Aslo if you could include the calories from fat (not the calorie count, just the calories from fat) I would appreciate that! Love this site!!! Posted May 31st, 2015 at 4:17 pm | Log in to reply. Posted January 27th, 2014 at 6:10 pm | Log in to reply. If I substituted dried pollock with raw instead how would the soup differ? Posted January 28th, 2014 at 8:36 am | Log in to reply. You need dried pollock to make bug-eo-guk. Fresh pollock has a different recipe. I will post it someday. Posted January 27th, 2014 at 6:14 am | Log in to reply. If I don’t have dried pollock but raw instead, how would the taste of the soup differ if I cooked it the the same way? Posted December 7th, 2013 at 9:14 am | Log in to reply. Thank you maangchi! i love all your recipe! Already done make this recipe! it turns out really well! I amazed with the taste of the dried pollock after taste this soup…what a chewy and tasty dried fish! i love it, only 1 problem that i have…i make the portion too much for one person! Posted October 8th, 2012 at 4:42 pm | Log in to reply. Just got all of the ingredients, going to make it tonight! I will take pictures for sure! Posted May 22nd, 2011 at 10:13 pm | Log in to reply. Someone added jalapeños and tofu to this soup and it was sooo good! Also one recipe from a Korean cook book coats the pollack strips with flour. Have you heard of this Maangchi? Posted May 18th, 2011 at 6:28 am | Log in to reply. Hi Maangchi! Thanks so much for this recipe. It’s one of my favorites since I moved to Korea. I just bought a bag of dried pollock to make it and I was wondering how to store the rest of the dried pollock once the bag has been opened. Would it keep fresher in the freezer? Posted May 18th, 2011 at 10:23 am | Log in to reply. Keep it in the freezer. It will always be fresh and moist. Posted April 29th, 2011 at 9:53 am | Log in to reply. I am so super wonder wif the taste of bugeoguk! Just seeing ur video, I can feel the smell of soup is so good! (drolling until now,lol). Cant wait to make it :)!! What I wanna ask is will it work perfect too if we use carrot instead of radish? Just bcoz our country is a tropical place, we dun hv four seasons, so most of the people here dun hv to drink soju or wine. Im just curious that too often eating radish, does it affect for our healthy? Seems radish is a cold vegetable. Posted April 29th, 2011 at 10:23 am | Log in to reply. Yes, this soup is very delicious! ” will it work perfect too if we use carrot instead of radish?” no, you need radish or daikon. Radish and dried pollack are main ingredients for this soup. This recipe was originally posted on June 4, 2010 at 2:36 pm by Maangchi. It was last updated on April 26, 2015. The video was watched 154,166 times on YouTube & has 1,136 likes!